Oak frame has seen a steady renaissance over the past couple of decades (self builders have played a big role in this popularity) and oak frame construction is in many ways a Modern Method of Construction — a term which, in broad terms, describes methods that involve off-site prefabrication. Oak frames are constructed off-site, and brought to site ready to be erected by an experienced team, often in under a week (depending on size and complexity). Infill panels of wattle and daub and later brick were originally used between the oak frame. 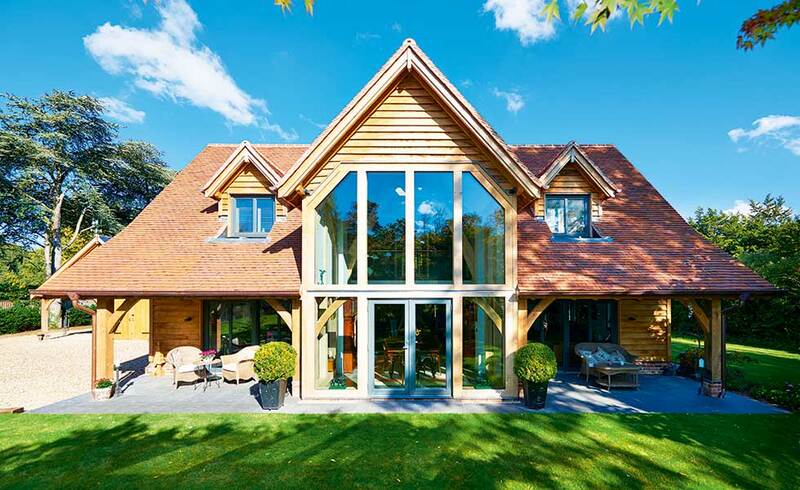 Today, the oak frame still fulfils a structural role, but in order to meet Building Regulations, the frame is typically ‘encapsulated’ within an insulated, airtight envelope, often using SIPs (structural insulated panels) — again prefabricated off-site. An oak frame home, wrapped in an encapsulation system such as SIPs, can be clad in a variety of materials, including brick, timber and render. Some homeowners, however, still want the look of exposed oak frame on both the exterior and interior. The good news is there are ways of achieving this: some of the larger oak frame companies in particular have developed ingenious solutions. Oakwrights, for instance, provides a bespoke system. Bill Keir, Oakwrights’ general manager, picks up the story: “Our patented 3i panel system meets stringent Building Regulations. The beauty of the 3i panel is that it maintains the look of a traditional ‘half-timbered’ house externally. Rather than have every timber visible both internally and externally (which causes coldbridging) many of the timbers are half-width. This means that only the large structural beams and posts are visible both inside and out. Designing and detailing an oak frame house needs a designer well versed in this construction system. Look for an experienced designer who understands span and bays, as well as the limitations of oak. “For construction drawings, it’s about understanding oak as a construction material. 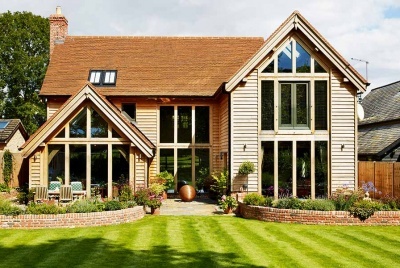 Oak frame is not as well understood by generalist architects and builders, yet the architectural detailing and the execution are crucial to lasting quality,” says Andy Parker of The Complete Oak Home. 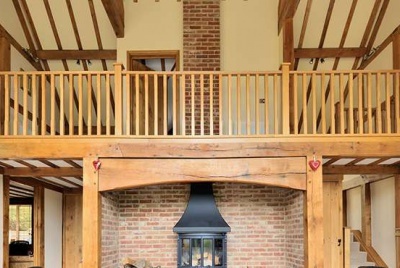 There are independent designers and architects with experience of designing with oak frame; they may have ties with particular oak frame companies, too. Another option is that Oakwrights, Border Oak, Welsh Oak Frame and others offer an in-house design service as well as a portfolio of different house styles. They will work with your chosen designer. Deciding how involved you want to be in the build can often influence your choice of oak frame supplier. Very few oak frame companies provide a full turnkey ‘package’ service. Those that do will often offer different levels of service too. 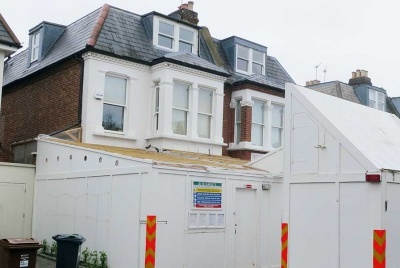 For example, they may supply and erect the frame, or build the house to a weathertight shell (allowing you to project manage the groundworks prior and internal fit-out after). There are several options, including the use of oxalic acid and sandblasting. “We recommend that frames are cleaned with oxalic acid as this is a softer and less intrusive process that allows the natural character of the oak to come through and also best showcases the detailing of the frame,” continues Merry. “Sandblasting can be a very messy process. “Oxalic acid comes in crystal format and should be diluted to the manufacturer’s recommendation — it should also be applied in strict accordance to their guidance as it is an acid (albeit made from rhubarb). It very softly bleaches the marks away but gloves and a breathing mask in a well-ventilated space are crucial. Some stubborn marks may need a few applications with some sanding/scrubbing in between,” concludes Merry. Part of the appeal of oak is that it does not need to be finished — externally it weathers to a silvery grey. There are some homeowners, however, who wish to retain the rich colour of green oak; this is possible, but it can be a labour of love. “There are treatments such as Sikkens or wax oils you can use to maintain the original colour, but once you start using such a treatment within an outside environment it will need to be repeated annually. Over time, sunlight will turn external timbers an attractive silvery grey, while oxidisation makes the internal wood more honeyed, which in our view is much nicer,” says Ed Hamilton of Oakmasters. It is, however, a good idea to take extra care in rooms subject to high levels of humidity and in spaces where splashes may be more prevalent (e.g. the kitchen). “Water stains especially can mark the frame, so care needs to be taken with rooms such as bathrooms. If the frame is likely to get splashed it may be worth oiling it locally with a suitable product to give it some protection,” recommends Rupert Newman of Westwind Oak. “Shrinkage is the one factor that is guaranteed when using green oak,” begins Paul Edmunds of Welsh Oak Frame. Green oak refers to unseasoned timber which has a higher moisture content than seasoned oak. “Green oak will have been felled in the past 18 months; the green oak frames will gradually lose moisture content and shrink over time, particularly in the first couple of years,” adds Ed Hamilton of Oakmasters. “Almost all mainstream structural oak framing in the UK uses green oak, rather than kiln-dried or air-dried oak. For superior craftsmanship, green oak is much better than seasoned oak for cutting and shaping. The natural seasoning process does not weaken the structure, but makes the oak harder and stronger as it dries. In fact, oak is high density and has a strength/weight ration superior to steel, giving it great load-bearing capabilities. Oak shrinks in width, not length, so there is no risk of a tennon slipping out of a mortice. Cracks and splits (a characteristic of oak frame known as ‘shakes’) have very little effect on the structural integrity of the frame. As the grading system limits the angle at which the grain runs along a piece of oak, the splits which open up along the grain as the fibres dry and separate do not traverse the beam’s grain and thus do not weaken it,” says Ed. Careful design and detailing on site, along with attention to the drying out process once the frame is erected, can minimise remedial work, as Paul Edmunds of Welsh Oak Frame, explains: “The condition of green oak is in a constant state of drying out from the point of felling, albeit slow. It is therefore critical that the skill and experience of the frame erector is recognised too. The expert eye of the carpenter on site is equally important in making sure that the frame goes up true and plumb and they have a keen eye on the condition of the oak before being assembled. Glazing also requires particular care. 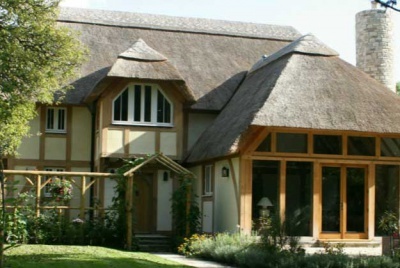 Face-applied glazing – whereby glazing is installed to the exterior of the frame, with an oak ‘strip’ used to disguise the join – is often used as a solution to oak shrinking. There are companies who specialise in this work, such as Black Pig Glazing. Consider using oak in just key areas such as the kitchen, living room, dining area, entrance hall or master bedroom. Oak lintels, joinery and details can then be continued throughout the home. Some rooms in the house just don’t benefit from oak frame, indeed it can be detrimental to their function, such as in a utility room or boot room. Consider keeping these spaces clear of oak frame to make them more practical and reduce cost. Choose a simple Queen post truss rather than complex arched brace trusses to keep costs down. Only use oak frame for the primary structure (big posts and beams), rather than the secondary structure of every joist and rafter. “Steelwork is often used to strengthen traditional carpentry joints and is typically unseen but allows us to create buildings which wouldn’t be possible using purely traditional methods,” begins Paul Slemmings, frame designer at Carpenter Oak. 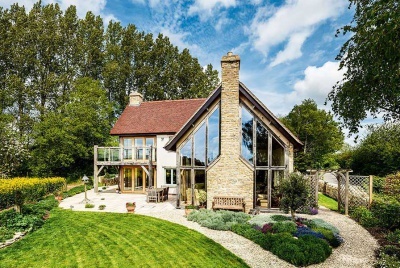 “There are many aesthetic and engineering reasons to incorporate stainless steel into an oak timber frame,” adds Paul Kirkup, director and frame designer at Carpenter Oak, who have been involved in many an impressive self build project. “Steel bolts and flitch plates can be used to end join or sandwich timbers together, with the fixings left surface mounted for an industrial look or highly polished and recessed flush into the timber for a sleeker finish. Oak frame can be a fantastic option if you are extending your home; there is perhaps no other construction method which offers such a versatile aesthetic. But there are a few factors to consider before deciding to extend in oak. “Green oak frames shrink, so if you are thinking of extending your home with an oak frame it needs to be detailed correctly. Ideally the walls, roof and glazing need to go on the outside of the frame. Glazing, especially, should be properly detailed to prevent any water leakage,” says Rupert Newman of Westwind Oak. 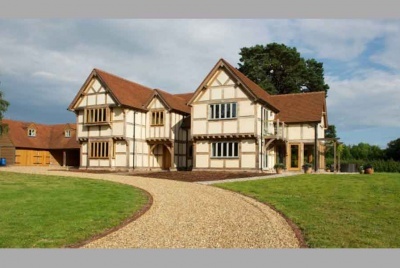 “Oak framed extensions tend not to be tied in with existing masonry or timber framed homes in case there is differential movement. Normally they are built on their own foundations next to the existing structure. Then a watertight movement joint can be incorporated between the old and new. This simply could be the lead flashing on the roof or some expanding ‘Compriband’ foam on the walls.